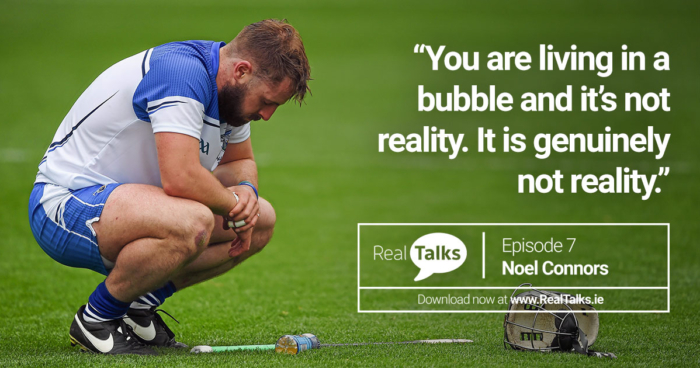 From the outset of episode 7 of the Real Talks podcast, you clearly get the sense that Noel Connors was born to be an intercounty hurler. His talent was embodied by his almost meteoric ascension through the Waterford ranks – he represented the county at Minor level when he was 15 years old and u21s at 17. So how has the now 27-year-old managed to maintain a cool head and not succumb to the pressures of life as two-time All-Star? Connors preaches balance and never losing sight of why we do things we love. Because we love them. Noel burst onto the scene as a supremely talented and deservedly hyped teenager. The poise and level headedness he has displayed throughout his time on the intercounty scene leaves many aghast. What’s his secret? How can still enjoy his hurling with all of the pressures and add-ons that come with it? As he told Alan O’Mara, sometimes you just need to step out of the world of intercounty hurling, ‘the bubble’ as Connors puts it. “You’re living in a bubble and it’s actually not reality. You have to step outside of that at times, and reflect on it and realise how fortunate you are”, he said. A thoughtful speaker, Connors’ natural gravitation towards education and broadening his horizon shines through with everything he says. His natural curiosity has also played a major role in helping keep a balance in his life between on-the-field and off-the-field. By seeking interaction with people removed from his sporting life, such as life coaches, Noel says he was able to bring greater clarity and direction to his life. “A simple chat with someone who didn’t give a fiddlers about who I was, where I came from, what I was doing — to just sit back and talk about you as a person and map out where you’re going, that was one of the most valuable things I’ve done. “Engage with people outside of the bubble. When you’re inside it, you’re inside it and can’t see outside of it. That’s not a negative thing, it’s just the way the environment is”, Noel said. This balance has helped develop leadership tendencies in the defender, so much so he has become the bridge between generations in the Waterford panel. There are few people who can universally relate to all ranges in a dressing room quite like Noel Conners. Having recently turned 27, he is young enough to be able to communicate with older and younger players alike. He’s been that carefree youngster playing at Croke Park just like he did out the back yard. He’s also been that older player, burdened by expectations and the fear of losing. “At 18 or 19, the only thought that was going through my head was to get out on the field and do as best I could. There’s no real expectation on you, it’s just go out there and hurl. Over the course of the first season of the Real Talks podcast, we’ve learned a variety of lessons from a variety of characters. Noel Connors’ on balance highlights another important issue we all face in our lives. As Noel himself highlights, sometimes getting an independent, outside perspective can really help find that balance. It also comes from those closest to us, in Noel’s case his girlfriend. That balance can help us all. If you are currently in difficulty or feeling suicidal, we strongly encourage you to tell a loved one, contact your GP, visit your nearest A+E or engage with these support services. © 2019 Real Talks. Website designed by Cian O'Mahony.